You see? I stop with the having-to-post-every-day thing and suddenly I don’t post for a month! 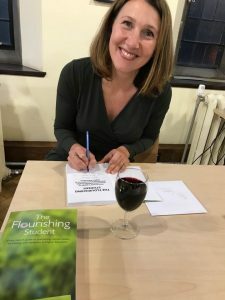 But here’s a wonderful reason for a blog: I took a trip down the M4 last night to be with Fabienne Vailes, author of The Flourishing Student, at her launch event at Bristol University. She gave a talk on student mental health – and that of tutors, equally importantly – which was attended by faculty, colleagues and the pro-vice chancellor, followed by a reception to celebrate the launch of her book. Fabienne is a winner of the 10-day Business Book Proposal Challenge, and it has been such a privilege working with her to develop not only this book but her career and the business she’s building around it, Flourishing Education. I am beyond proud of the book that’s emerged – it’s a really significant contribution to the vital discussion around mental health and the resources and responsibilities of those on the front line working with young people. There’s nothing quite like the moment when you sign your book at your launch event. I think this smile says it all.